Providing toys for your pet bird is absolutely essential. He needs toys to prevent boredom and keep his mind active. Without toys, your bird can easily develop behavior problems like screaming, feather plucking, and biting. Attachments – The safest toy attachments are C-rings. 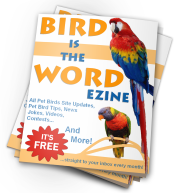 They are safe to use for all pet birds. The most dangerous attachments are the keychain ring and split rings. Bird toes have been caught in a number of these rings because of their size and shape. 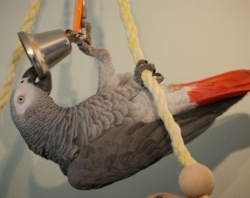 Rope and Chain – Pet bird toys are usually hanging by a rope or chain. Make sure that they are close-linked chains (at the right size) and that whatever holding it is strong enough for your bird (or you’ll just be replacing it the next day). Bell – No jingle bells. These are the round bells with small slits in them and are unsafe for any bird. Material – Toys are made out of all kinds of material. The most common are acrylic, bungee cord, fabric, wood, plastic, leather, and rope. Acrylic toys are easy to clean and are often interactive-type toys which are great for relieving boredom, but make sure they are strong enough for your bird. Bungee cords are fun and most are safe, just make sure that your bird can’t get himself tangled in it. Fabric is another favorite and are great for birds with a habit of feather plucking. Wood is very common and great for chewing–choose wood toys that are made with natural wood and birds really like ones with colors (non-toxic, of course). Plastic toys are best for smaller birds because larger birds can crack them and ingest pieces. Leather is fun, but difficult to clean and you need to make sure that no toxins were used to treat it. Rope is definitely a popular favorite because birds love to preen them. This is probably the best preferred toy material for canaries–they just love it! Just make sure that your bird can’t get any strands wrapped around his toes and that the toy is always clean. While keeping all of these things in mind, it can become difficult to find the right pet bird toys. And on top of that, it’s difficult to find a good variety. Many birds need toys rotated out often to keep them entertained. Some birds are said to not really “need” toys (like canaries and finches), but many are said to love and play with toys. It’s also a great way to enrich their environment with variety and entertainment.